The Nash – Artworks PHX – a business-arts campaign in Phoenix, Arizona USA. Business owners launch unique concert venue to engage local and student jazz musicians. 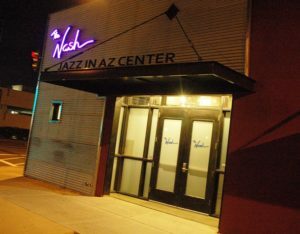 Jazz is alive and thriving in the heart of downtown Phoenix on Roosevelt Row, thanks to The Nash, a lounge-like concert venue where enthusiasts can experience jazz in many flavors, and performed by artists of varied skill levels. Students, local professionals, and nationally acclaimed touring musicians are all featured on The Nash’s calendar of events. 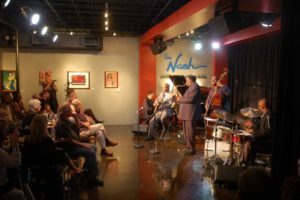 Owned and operated by nonprofit Jazz in Arizona (JIA), The Nash has numerous programs in place to mentor young aspiring musicians, and ensure jazz continues to thrive in our state for years to come. The venue hosts jam sessions, master classes, improvisation workshops, and even showcases promising talent in the ongoing “Catch a Rising Star” performance series. To extend its reach beyond downtown, The Nash partners with schools and arts and culture organizations throughout Arizona, giving jazz lovers an opportunity to participate in a variety of music education programs within their own communities. They can enroll in one-on-one private lessons, combo labs, jazz camps, guided listening workshops, jazz in film classes and more. The business model that supports The Nash is built on the love for jazz. Patrons can pay a $10 monthly donation to become Sustainable Members, and in exchange receive early access to special event ticket sales, the monthly “Jazz Notes” e-newsletter, and tax benefits as donors. Sustainable Member fees help provide the steady revenue stream needed to support the organization’s music education programming. which is ultimately grooming young aspiring musicians who will comprise future programming at The Nash. Beyond music performances, The Nash also serves as a space for artists to exhibit their works. Art shows are open to the public and center on themes that unite lyrics, instrumentals, and visual art into one cohesive show. Bryan Albue, The Nash Board Member and an Attorney at Sherman Howard.